My name is Rachel Erie and I am a summer intern with the Education Department here at Seattle Opera! I am originally from the Seattle area, having grown up in Kent and Auburn and graduated from Auburn High School in 2003. Music, specifically singing, has been a part of my life from the beginning. My mother studied voice, as well as many other instruments, and graduated from the University of Washington with her Bachelor of Music in Vocal Performance. Singing became a passion of mine at an early age. However, opera did not gain my attention until later. I did not learn my first aria until preparing for college auditions, for which I was applying as a Music Business major. I did not see my first opera until 2003 when my mom took me to the Seattle Young Artist’s performance of La Boheme. It was in that show I realized I wanted to be involved in opera. After my first year of college at DePaul University in Chicago, IL, I decided Music Business was not where I was called. I had only taken one class in the curriculum, but it focused on popular recording arts and planning world tours, things I was no longer interested in. Not once in that class did we discuss the classical realm of performance, how to run a symphony center or an opera company. I changed my major to Vocal Performance and transferred to Indiana University to complete my degree. Throughout my college career, a love for opera has grown immensely. Not just performing and observing, but also the study of libretti, musical analysis, costuming and sets. As a visual learner, I love how opera brings together both aural and visual elements to convey the story. As I complete my Masters degree in Vocal Performance this coming year, I am required to take two classes in an outside field. For that, I am exploring Arts Administration. As I have continued my classical music studies, I have been drawn to administration again, but with a focus on classical music and non-profit. Although performance is something I am passionate about, I also feel a need to share with people the wonderful aspects of opera and similar forms that have inspired me so much. I had been looking into possible internships in administration when my mother mentioned this summer’s education program with Seattle Opera. I saw this as a perfect opportunity to expand my knowledge of Wagner and his Ring cycle as well as learn about the company from the inside. I am thoroughly enjoying my work with Seattle Opera so far this summer as we in the Education Department prepare for the Ring of the Nibelung and the Experience The Ring program for students ages 14-21. 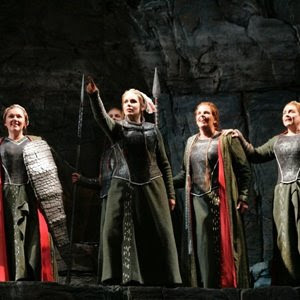 I am delving in to Wagner’s Ring to learn the inspiration behind the work as well as the story, musical meanings connected with leitmotifs, and how this series of operas connects to us today. For me, the experience of researching, compiling, and presenting will resemble many of my college classes. However, this experience will be a view into how an opera company works, from the rehearsal process, and creation of schedules to the design of sets and costumes, and production of promotional materials. This summer looks to be very rewarding for the student, performer, and potential administrator within me. You landed at arguably the best state university music college, that at I.U. (this comes from an OSU grad!)! And you defi nitely landed at the best place to learn about opera, Seattle Opera! An acquaintance of mine in Schwerin (Germany), where my apartment is was (Ulrike Stern) was an intern some years back at Seattle Opera and found the experience MOST valuable; she is now the Assistant to the Direktor of the Fritz-Reuter_Theater in Schwerin. Toi, toi, toi for your career in the performing arts!! Sorry about any confusion with this post. I had to post it on behalf of one of our summer interns, Rachel Erie. I let her know about it though, and told her to substitute my name out. Of course I did get my start as a Seattle Opera intern and now work here full time in the Education Department, so things worked out pretty well for me!